Have you seen our ebay reviews? Its the most amazing product I’ve worked with, and experienced in my life. Thank you so much to the person who came up with that idea of creating this unique tool. 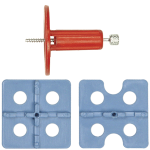 When I first looked at tile leveling systems I was impressed with the ATR system because of the use of only one spacer per four corners. I was unsure of which type of spacers to use so contacted ATR and found them to be very helpful in explaining the different types of spacer. 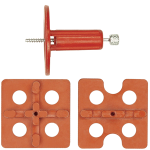 I have now used the 2mm universal spacers on numerous tiling projects and find them easy to use and great at eliminating lippage. The system is great at helping to produce a professional finish on 600mm x 300mm rectified tiles. My name is Robert Hovodzak and I am a big fan of your product. As a contractor in USA, have read about your product on a forum, while I was seeking for an easy, user friendly solution to eliminate the mistakes of my tile works. I’ve found your system and using it ever since. I am moving back to my motherland of Hungary for good and really want to make my people’s life easier as well and give them a chance to know and use this great invention. Wishes the best and please keep up with the hard work and make that hard work less hard! The system is very user friendly, accurate and fast to use. The levelling system makes tiling easier, faster and the final results incredible. Consistent grout gaps between tiles, and more importantly: no upstanding tile edges. Whilst using it on a large tiling job I had a query about the tile levelling system, and contacted the supplier. Andy offered to come out to the job site and clarify my query. It’s rare these days to get good customer service, and I was blown away with the service I received from Andy. He is very passionate and knowledgable about his product. Apart from that he left me with an ATR polo shirt which I wear with pride! I highly recommend this product to tilers. ATR Tile Leveling System – simply second to none! Have worked with ATR for a few years now, and claim to know how this works.. tiles can be leveled properly, virtually no lippage and other dramas caused by uneven walls / floors, no need to remove tiles and add / remove glue etc etc. I am not a professional tiler, but am a mad renovator and investor, have done about 30 bathrooms / kitchens / toilets etc. Using ATR means that the quality of my workmanship has increased dramatically, to the extend that people do not believe me when I tell them that I did the tiling myself. There are also some “fringe benefits” that only become obvious when you actually start using ATR ! For example – when placing wall tiles above another row underneath, tiles can not accidentally slip and fall down (besides smashing the tile itself this can of course also damage the floor tiles you just finished laying!) as tiles are guided into position by the caps of the ATR system. ATR also greatly helps with “dry-tiling” – a term I use when laying out a more intricate job on the floor without initially using glue – tiles are firmly (though temporarily) held in position allowing you to play with different alignments and patterns, and to pre-cut angles, holes, recesses etc. This can be a little time consuming, yes, but pays off big time later on when everything falls into place exactly as laid out and planned. Customer service is also excellent – I can buy ATR from my local tile shop at the Gold Coast, or if they happen to be out of stock of anything Andy from ATR is very helpful and can help quickly with delivery directly from their warehouse in Melbourne. I would not entertain ever doing another tiling job without using ATR – full stop. The costs are negligible when compared to the many benefits – besides the ease of laying your job will look so much better! I was looking for a technique to eliminate as much lippage as possible in my home projects. I found these. RE-use the top and automatically space with the bottom. My wife is pleased and that makes the tiling project a DIY instead of hiring the job out. I get the satisfaction of doing my own work. Priceless. I am absolutely wrapped with your product! After doing previous jobs laying large tiles your product has enabled me to achieve far superior results in less time. The customers comment on how great the tiling looks and a lot of this is a direct result of your product. Looking forward to continuing use of your product on upcoming jobs. Thank you guys thanks for creating a fantastic product. I have been tiling for over ten years now and this is my first experience using a tiling system. I must say that after using the ATR system I am now a convert and will be using this system on all future tiling jobs. I love this system. I’ve looked at other more expensive systems but ATR is by far the best product and system. Well done to Anthony and what a super helpful person. I have been tiling for 30 years. I think ATR is the best leveling system. Have you seen our USA reviews?